This post is for Three Line Tales, Week 66 by Sonya! I loved this idea. It teaches us that life is a mixture of good and bad so we need to be happy and not remain sad. Thank you, Sonya, for this little initiative. Please do participate in this little fest on Only 100 Words. Write three lines inspired by the photo prompt (& give them a title if possible). Link back to this post (& check the link shows up under the weekly post). Tag your post with 3LineTales (so everyone can find you in the Reader). Read and comment on other TLT participants’ lines. If you want your post to be included in the round-up, you have until Sunday evening to publish it. © The Glitters Of Life. All rights reserved. A good interpretation of the picture Sheetal! Great, “Thinker”. Light is something that exists everywhere into our emotions, feelings, our whole body, Mind and everywhere. So, light is a “Universal Avenue” that is finite with its expectations. ” GREAT WoRk”. Wow Sheetal a wonderful way of penning your words with the picture. Great. Hey! 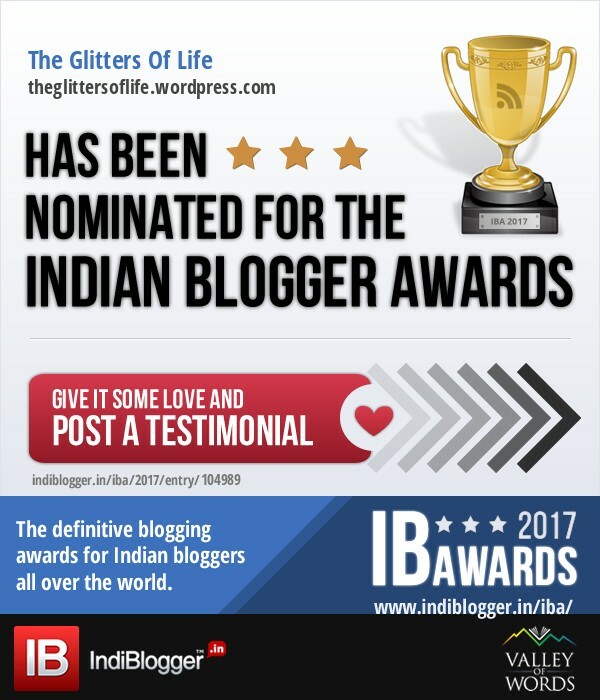 Nominated you for the Awesome Blogger Award! It was splendid Sheetal. I am glad that I stopped by. I am new here…please check my site and if u like feel free to follow back. It will be greatly appreciated. Sweet simple amazing and yet it speaks volumes! Loved the picture.. the font color and the slight soothing rhymes! Want Me To Ping You? No posts should be published on other sites or blogs without the prior permission of the author. © The Glitters Of Life. All rights reserved.